Produced by master of schlock William Castle, this jailhouse drama was filmed inside Arizona State Prison, with the real warden and real prisoners appearing as extras. While the warden's away, Gene Hackman leads a revolt and takes over the prison's isolation wing, holding several guards hostage. 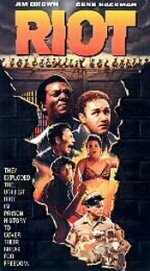 Jim Brown is a prisoner who thinks Hackman has made a big mistake, a view confirmed when the 35 convicts start to dig a tunnel, knife each other and form a society of drunken bigots, complete with a party with men in drag that's strongly reminiscent of Stalag 17. Strong performances from the leads and a half-decent script based on a real-life incident, place this film a notch above similar exploitation fare.